Thank you to everyone who sent kind thoughts and words my way this week. It is going to be a big adjustment with Grandma gone. I've been going to see her in a nursing home almost every week for seven years. When someone lives to be 103, you kind of expect them to go on forever. I always sort of thought that, 30-40 years from now, I would be in the nursing home with her and going to visit her from my room down the hall. Still, it is a relief that she is free of her tired, aged body. I'm happy for her. 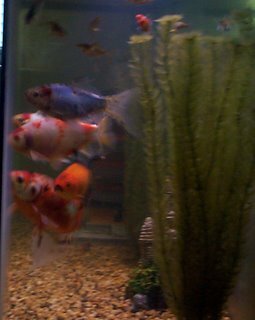 That is them staring at me out of the end of the tank! (Sorry so blurry.) They do this all the time now when they are hungry. It was pretty weird when I realized that they were actually looking at me! I did tell them that they weren't to eat the little fish. I guess they paid attention! Wow, you have trained fish! How can I obtain a gift certificate from your store on line? Thanks! Our little friends seem to quickly realize who feeds them, eh? Glad to see they stopped eating the little ones too! You need a camera with a polarizer. Sorry, have not been to your blog since Halloween. I give thanks for the Circle of Life now completed by Your GrandMother. My Condolences. Great looking Fish too! My childrens last Pet Animal, Ms Patches, a cat, wakes me up at 5:30 am everyday and guides me to the kitchen. She gets right in front of me and makes me go Her way.